Important Dutch polymath, humanist theologian, poet and historian. 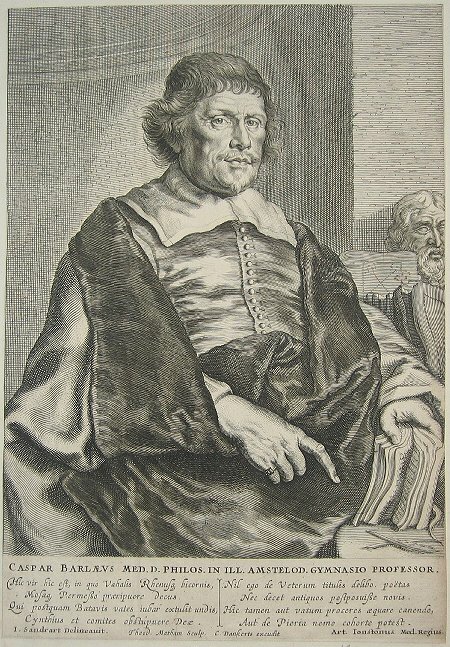 A student of theology and clergyman, he subsequently became Professor of Logic at the Univeristy of Leiden and from 1631, was active at the Amsterdam Athaenaeum Gymnasium. He was also a medical doctor and resident of Caen in northern France. His volumes of poetry, particular Latin poetry, were also highly regarded. He produced the eulogy that accompanies the famous 1622 portrait of cartographer Willem Blaeu. In 1622 he translated Antonio de Herrera's Description of the West Indies and in 1627 provided the text for Jodocus Hondius' small format Atlas of 30 maps of Italy. In 1647 he produced an account of the 17th Century Dutch colonial empire in Brazil, containing numerous important maps and plates of the region.